Amb. Deborah L. Birx, M.D. 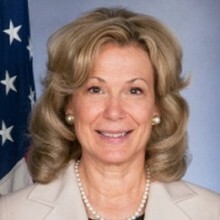 Ambassador-at-Large, Deborah L. Birx, M.D., is the Coordinator of the United States Government Activities to Combat HIV/AIDS and U.S. Special Representative for Global Health diplomacy. Her three-decade-long career has focused on HIV/AIDS immunology, vaccine research, and global health. As the U.S. Global AIDS Coordinator, Ambassador Birx oversees the implementation of the U.S. President’s Emergency Plan for AIDS Relief (PEPFAR) and all U.S. government engagement with the Global Fund to Fight AIDS, Tuberculosis and Malaria. Serving as the U.S. Special Representative for Global Health Diplomacy, she aligns the U.S. government’s diplomacy with foreign assistance programs that address global health challenges and accelerate progress toward: achieving an AIDS-free generation; ending preventable child and maternal deaths; and preventing, detecting, and responding to infectious disease threats.